Warren Buffett is rare among CEOs in publicly recognizing the economic benefits of Medicare for All. Talk of single-payer health care in the United States popped up in an unexpected place recently: the most recent Berkshire Hathaway annual meeting. “The whole system is cockamamie,” the company’s vice chair, Charlie Munger, declared. “I think we should have single-payer medicine eventually.” As for partner Warren Buffett, the man known by his fans as the Sage of Omaha, he called health-care costs “the tapeworm of American economic competitiveness” and claimed he “personally” supported a single-payer system. Those of us who cover individual investing know that the utterings of Buffett and Munger are generally repeated, and repeated again. They turn into aphorisms—how many times have you heard it said of the stock market, “It’s only when the tide goes out that you learn who’s been swimming naked?” But when it comes to health care, it’s something else. There is a day or so of attention, and then it’s nothing but crickets. What’s going on? You can thank a toxic stew of ideological blindness, fear of controversy, and rampant cost shifting for the silence. The size and power of the industry is a factor too. Healthcare “is the military industrial complex of the 21st century,” says Richard Master, the chief executive officer of MCS Industries, a supplier of picture frames based in Pennsylvania, and the rare C-suiter to publicly support single-payer. The United States spends more than $3.3 trillion on health care annually. Employer-based insurance covers about half the non-elderly population. The cost is not unsubstantial. Medicare spends less than 2 percent of its budget on administration vs. 18 percent for private insurers. According to the Kaiser Family Foundation, the average premium for a family was $18,142 in 2016. The typical employer picked up about two-thirds of that total. The numbers are adding up, and the politically vaunted small-business sector is yowling. The National Federation of Independent Business’s 2016 Problems and Priorities survey found more than half of those they polled claimed the cost of health insurance was “a critical issue,” they faced. Healthcare costs also eat away at American business competitiveness. Prior to the Great Recession, General Motors claimed that providing health-care coverage adds another $1,500 onto the sticker price of every new model sold. Starbucks reported around the same time it spent more on health care than on coffee beans. The Affordable Care Act has slowed the overall pace of health-care spending, which nonetheless still exceeds the rate of inflation. 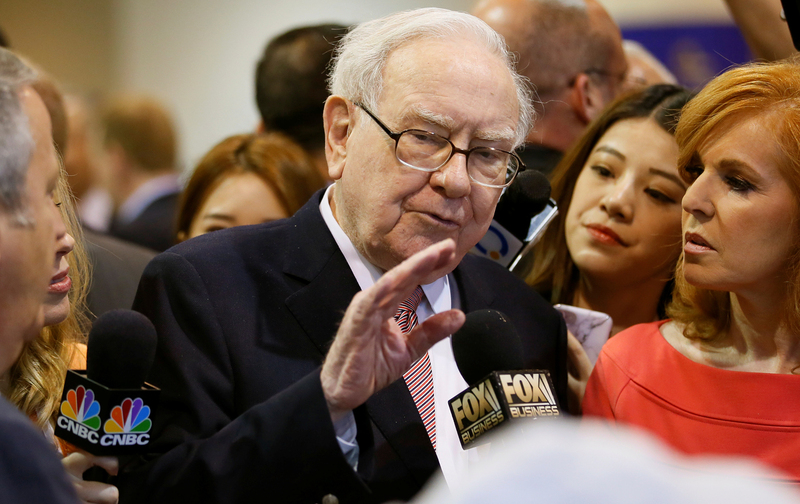 Buffett’s economic point—one he’s made for a number of years—is that corporate honchos obsess about the weight of taxes on their bottom line when they should be pondering the impact of skyrocketing health-care costs instead. For years, he’s pointed out that health-care expenditures were approximately 5 percent of the gross domestic product in the 1960s. Now they are at about 17 percent. Other countries spend significantly less. Healthcare costs make up 11 percent of Canada’s gross domestic product. In Australia—about which Donald Trump recently said, “you have better health care than we do”—it’s approximately 9 percent. But all this spending isn’t exactly doing wonders. About one in ten American adults still doesn’t have health insurance. Our reputation for world-class care might be a tad exaggerated; our maternal mortality rate has increased substantially since 2000. Never mind the moral argument for health care for a moment. Pay more money for lesser results? Surely, no sane businessman or businesswoman would want to deal with this, not for one blasted moment. In this environment, business and corporate support for single-payer/Medicare For All/whatever you want to call it should be the proverbial no brainer. But it’s not. Many in the United States business world remain in thrall to a marketplace ideology, mixed with a whiff of self-help. The glory of the market is paramount, and any attempt to enhance the role of government—even when it is in the best interests of the players to do so—is looked on with suspicion. For example, when runaway medical costs caused mass business agita, former Safeway CEO Steve Burd founded a group called the Coalition to Advance Health Care Reform. It endorsed universal coverage but argued it needed to be “market-based” and offer “universal coverage with individual responsibility.” These days, people needing insurance or medical care are routinely referred to as “shoppers” who should compare the price of medical services like they would a can of peas. The American Sustainable Business Council, a left-leaning business trade group, is now seeking to change things. It recently debuted, in conjunction with a documentary Big Pharma: Market Failure, an action group called Business Leaders Transforming Healthcare that is making the case for single-payer as a business imperative. More than 150 businesses have signed on to the campaign, including Richard Masters’s MCS Industries, who is also in the film. But it’s going to be a battle. Many of the American Sustainable Business Council’s most recognizable corporate partners have yet to join in. Jessica Alba’s The Honest Company—a self-described “mission-driven company” dedicated to, among other things, “corporate social responsibility” and “taking selfless actions that benefit others”—wrote back that they work with the American Sustainable Business Council on “issues related to chemical safety and ingredient disclosure” and aren’t “currently engaged” in other initiatives with them. The others ignored me. I can’t say I am surprised. Corporations are notoriously loath to endorse controversial positions, especially ones that have the potential to put them in the firing line of activists on one side or the other. Then there is the power of the health-care industry, which is responsible for the largest number of jobs added since the last economic downturn. Business leaders stick to the powerful until it’s all but unsupportable. In lieu of asking for government help, many American corporations are dealing with the health-care expense in a time honored capitalist fashion: they’re sticking it to the workers. A majority of those with employer provided health insurance now have a deductible of at least $1,000, which partly explains why out-of-pocket health-care spending for someone with employer provided health insurance has increased by more than 50 percent since the beginning of the decade. Little wonder recent Congressional Town Halls feature many plaintive pleas for single-payer or a Medicare expansion.